As economists from across the globe are grappling to find a new name for Barack Obama’s economic policies, I have beat them to the punch. Cluelessian is Obama’s new model for future economic (failures). Thus, in an effort to ensure that others do not slip and fall down into the same bottomless pit, let me help you define the difference between Free Market Economics and Cluelessian Economics. The two most basic concepts in free market economic theory are the laws of supply and demand. Under the law of supply as prices increase the quantity of goods and services increases, as additional investment is attracted into the market. 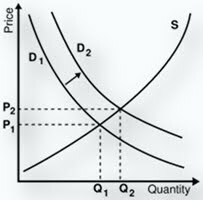 Under the law of demand as prices decrease, the quantity of goods and services demanded increases, because more consumers are able to afford these goods and services. Where supply and demand meet is at the prevailing market price. Now when a price is set below the prevailing market price in order control prices, less investment is attracted to produce the supply. 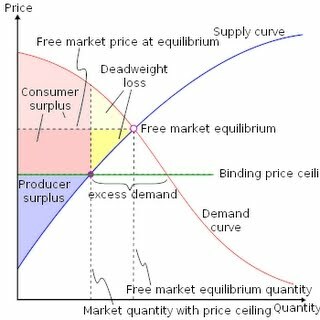 Where the price is fixed as in the graph below, the quantity demanded is higher than the quantity supplied, thus creating excess demand, better known as shortages. And shortages lead to rationing. Under Cluelessian Theory, the laws of supply and demand didn’t work for everyone. Thus, what is being proposed with health care reform is an increase in the number of people covered by insurance through a legal mandate (demand), without increasing the price. This is only possible under the Cluelessian Model. In fact, under the new theory demand will increase, prices will decline, supply will decline (as insurance companies go bankrupt) and higher income taxes will make up the difference. Under Cluelessian theory you actually wind up paying more for less, but that’s all right because higher taxes don’t count towards the price of health insurance, right? Also by following the Cluelessians we can get rid of all those evil, greedy doctors and insurance companies at the same time. So under Cluelessian theory it would appear that we would actually destroy the free market system, and create not only government run health insurance, but also government doctors and hospitals. Now when it comes to making an impact on the effects of that evil, and relentless Sun, that sits in the middle of our solar system spewing out all that heat, the laws of supply and demand just don’t quite cut it. So it will be necessary to dramatically reduce the supply of electricity, coal, natural gas, and gasoline; meaning that prices will necessarily ‘skyrocket’ (a Cluelessian axiom). A. Raising taxes to help those who can no longer afford their energy bills? B. Coming up with a nifty formula to demonstrate how many human beings they saved, or how many years of life they added to Planet Earth? Under Cluelessian law, a job saved (or created) is equal to giving a pay raise to existing employees. Contemporary economists thought that a job saved entailed cancelling a layoff, or recalling laid off workers; and that a job created meant hiring new employees on top of the existing workforce. However, under Cluelessian theory, whatever makes you look good counts. As we saw recently in the news, the Southwest Georgia Community Action Council was able to save 935 jobs by providing a cost of living increase for only 508 people. (See the last post: Jobs and O-bonics Interpreted). The Cluelessians haven’t yet been able to formulate a way to actually create jobs so please check back for updates over the next three (3) years. So in conclusion it’s not very hard to understand Cluelessian Economics. Simply throw away the idea of a free market system. Forget about the laws of supply and demand. Under this new theory the Government will take care of all of us. The Government will supply our health care, energy, and employment needs. The Government will take the place of the free market. The Government is good, and we are bad. The Government knows all. And when the Government runs out of money, then under Cluelessian law, they will make up another lie (i.e. blame Bush). Now if you want some real answers, you should check out The Just Third Way Blog, or The Center for Economic and Social Justice. You may even want to read, Capital Homesteading for Every Citizen or Binary Economics: The New Paradigm. You Hit this Nail On the Head. Very simple-minded. But what would you expect from a conservative. You do know that conservatism is a mental disorder?